All four floors of the Gladstone Hotel will be taken over by plants, birds, feathers, clouds, “plarn”, algae, hemp, bamboo, cow bones, and more at Grow Op 2019! 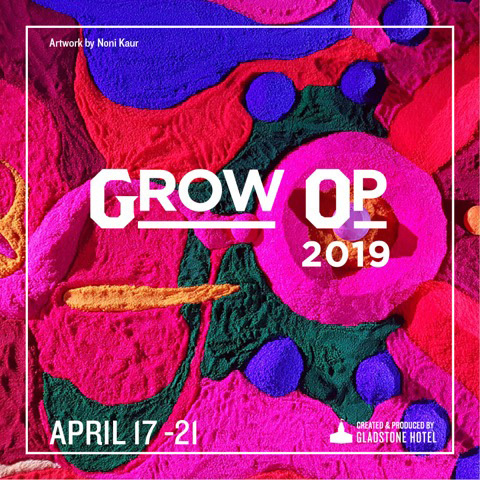 Grow Op transforms all four floors of the Gladstone Hotel with 25+ immersive installations celebrating innovative ideas and conceptual responses to ecology, environmental sustainability, landscape design and contemporary art. Think Allan Gardens meets Come Up to My Room! Learn more about this year’s curators, artists and programs. A highlight of the show is the second annual Grow Op International Artist Residency which begins at Artscape Gibraltar Point on Toronto Island and continues at the Gladstone during the exhibition. The residencies allow the artists to engage with our city, connect with other artists, and deepen the conversation around crucial issues. This year’s residency features Maria Thereza Alves (Berlin, Germany and Naples, Italy) and Mary Kavanagh (Lethbridge, Alberta). Join us for an artist talk on Sunday April 21, at noon. Tickets for the talk are free; register at Eventbrite. Buy exhibition tickets online or at door (cash only). The Gladstone Hotel is an accessible venue.